The reveal season for Rastakhan's Rumble has kicked off with the customary live stream. This time, the hosts are Senior Game Designer Peter Whalen and Regiskillbin. The stream has conculded. 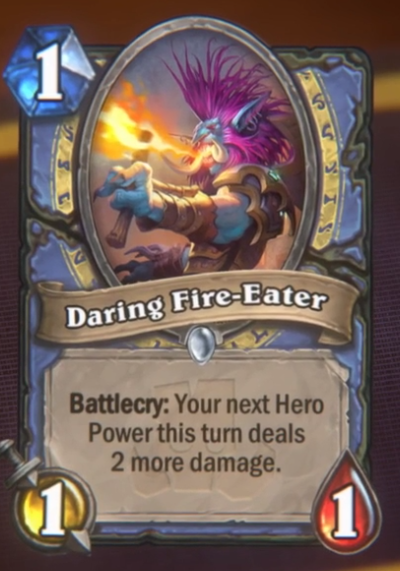 All the cards revealed will also be added into our Rastakhan's Rumble hub. The full schedule for the following card reveals can be found here. The counter doesn't start over if you bounce Jan'alai! 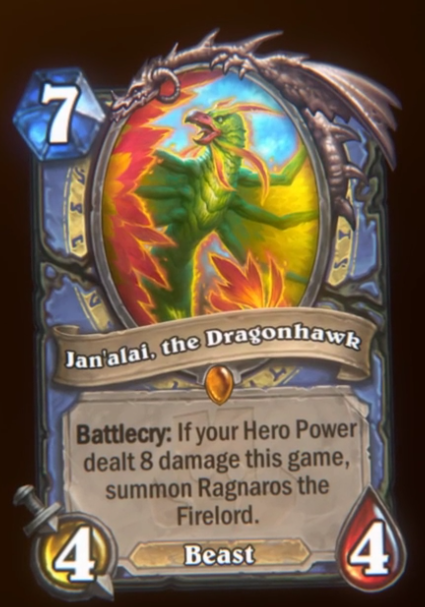 The Hero Power hitting adjacent minions counts for Jan'alai's counter! Works with Frost Lich Jaina's Hero Power. However, Ice Walker only freezes the targeted minion and not the adjacent ones with the Spirit present. This thread will be updated live as the stream progresses. All the cards revealed will be added into our Rastakhan's Rumble hub. The full schedule for the following card reveals can be found here. The fact that Oondasta isn't a 10 cost/20 attack/20 hp card confuses me. Remember back in MOP having 2+ 40 man's trying to kill him? lol. 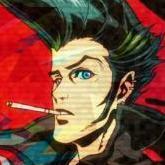 Best boss imo nobody had anything on him at his time of release. Don't forget about the best chieve that came with him too "Millions of Years of Evolution vs. My Fist". Still gives me a chuckle when I am reminded of it! 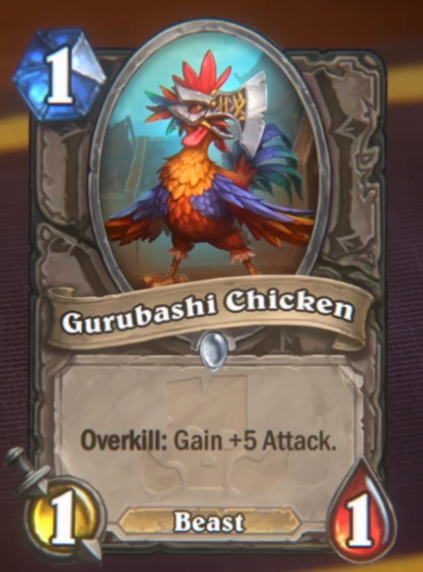 Anyone else thinks adding that chicken to deathstalker rexxar's card pull will be scary !!! 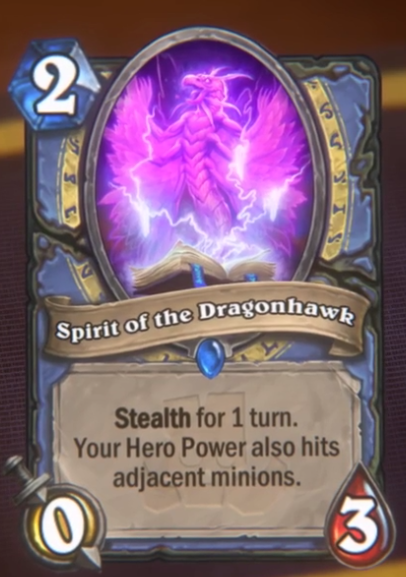 Does the spirit affect DK's hero power too? Like, if there are 3 1-health minions side by side, and you target one of them, you get 3 Water Elementals. Sounds kinda crazy. 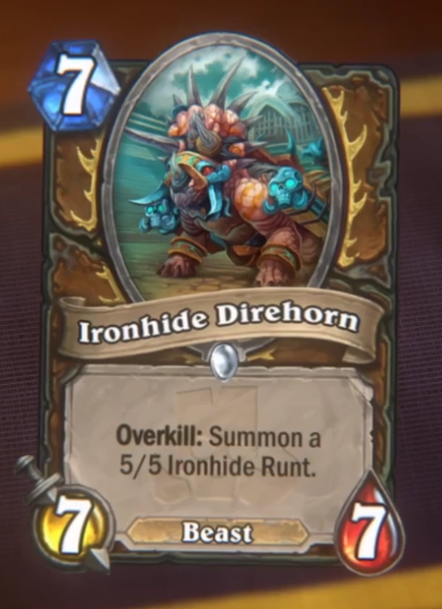 Direhorn is really cool and interesting, but a bit too fair, good for arena, won't see constructed play though. 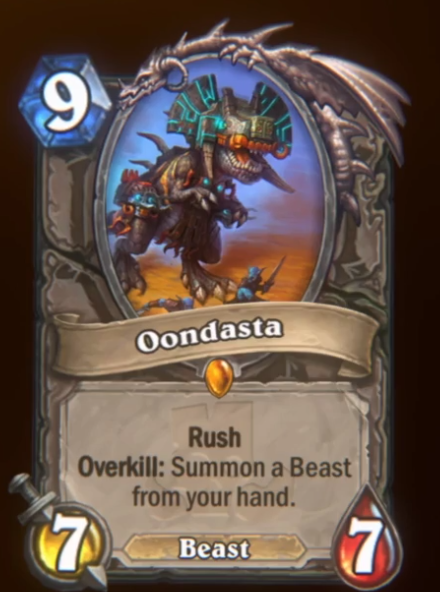 Oondasta has potential in the big Hunter deck, probably no where else, but that is some value right there. 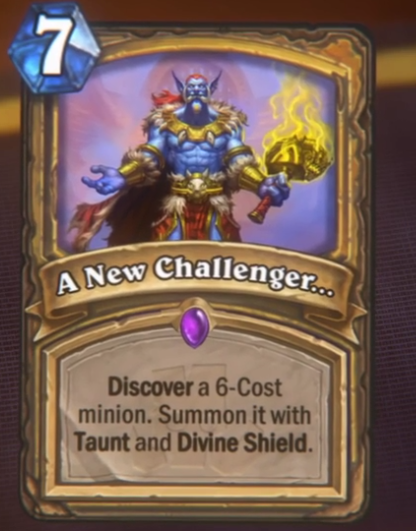 A new Challenger seems really fair, would have to figure out what the average results are, but probably not good enough for 7 mana. Great in arena though. Zentino is aweful. Like a legendary that has poor stats to Mana ratio, that requires a certain board state, as well as being combined with certain spells? That is a lot of stuff that has to go right to get any value out of him. The bird is good, fits into oddmage which is great, don't know if mage really needs another value finisher though. They have a ton of less conditional ones then this. The spirit feels kind of meh. Don't think the effect is really useful. Too specific and the stats are bad on the boards the effect is good on. The fire eater is amazing. A 1 Mana 1/1 that turns your hero power into a dark bomb? On top of that, in odd mage it gives a powerful on curve answer to things like the thug from odd rogue. Just seems like a very strong early game card. If we are going by that Y'shaarj should be the strongest card in the game. 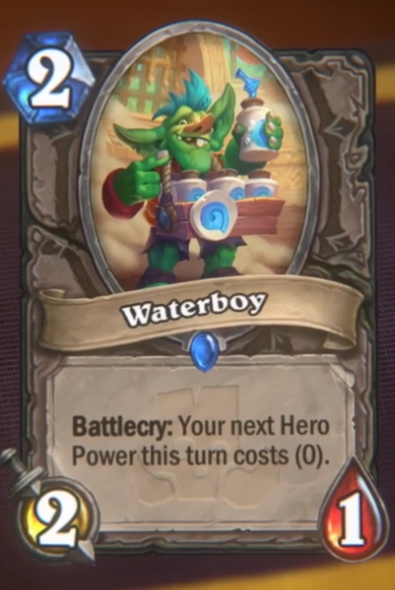 Hmm, most 6-drops are quite good ( Damaged Stegotron, Cairne Bloodhoof etc.) but I think this card might be important for a new Spell-Paladin-Archetype, together with the new Lion-Cat-Loa-Thingy. According to kripp, it casts the spell again so for stuff with overload you get the overload three times. So logically you should get the three jades. Some other things kripp noted that haven’t been mentioned here are that Oondasta might be good with some of the new class legendaries that are beasts (like the 25 mana paladin one), and Zentino has some powerful options when used on your own minions. 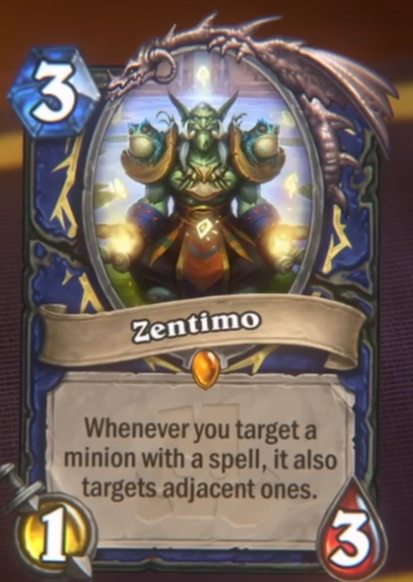 Zentino+2Rockbiter+Windfury on three 0 attack totems for instance is 36 dmg.